Today I headed out the door for work at the last moment, only to find my car had a flat tire. The cab, that I called for, took nearly 30 minutes to arrive and when I got to work, my boss rode my but cause I was late to work again. Did you every have a day like that? Well... of course you have, we all face challenges like this from time to time. So how do we get through these frustrations. Well, we could accept that other folks have it worse than us, but more'n likely we do what Blake Shelton does, and dream of the day when we won't have to put up with this kind of sh*t anymore. At least, that's what he does in this song, 'Some Beach'. Written by Rory Lee N Feek & Paul Lester Overstreet, this is a sharp piece of lyrics that's bound to take your mind off your troubles. Blake made a pretty penny of the release of this tune so I bet he was laughing all the way to the bank. Me..? I'll settle for this great song. I just had to try to cover it. My friend, Reg Jones, once tried to teach me clip-so time. He said it was easy to learn but I never could master it and that is what this tune should be done in, so I hope I can pull it off good enough to fool somebody. Well here is my effort. 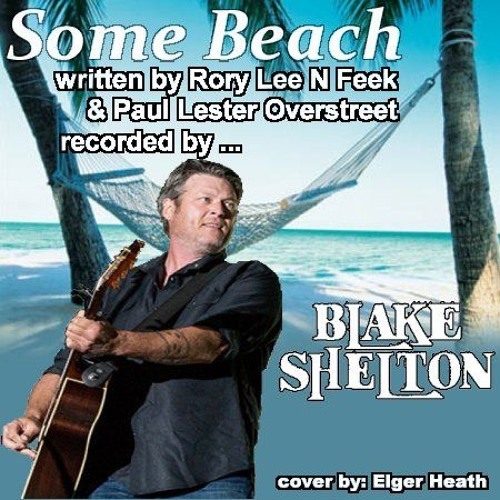 Check out the original recording by Blake Shelton but right now take a listen to this cover.